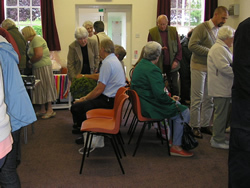 The Friendship Groups second fundraising event of the year, a Summer Garden Party, was planned to take place in the Spinney. Unfortunately, the wet weather forced a last minute change of venue with it taking place in the Recreation Room instead. 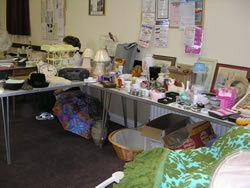 Once again, there were all the usual stands, including tombola with many prizes, bric-a-brac stall, book stall with a large selection of books and a homemade cake stall (always popular!). 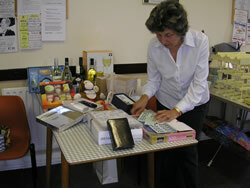 There was also a raffle for a large hamper of fruit donated by Kath Whitcomb and a separate raffle with a selection of lovely prizes. Refreshments were available throughout the afternoon of homemade cakes and scones with jam and cream along with teas and coffees. Despite the wet weather it was quite well attended with everyone enjoying the welcoming friendly atmosphere. Grateful thanks go to all who helped, organised and supported the event. 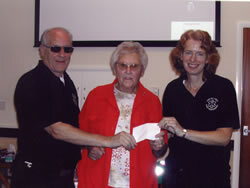 £400 was raised for the groups chosen charity, Five Villages First Responders. 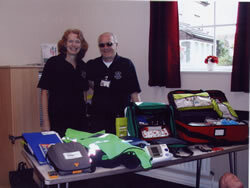 On Friday 25th September Mr Colin Gibson and Libby Stennet from the Five Villages First Responders came along and gave a fascinating talk and showed us all the equipment they require to carry with then when responding to a call. Afterwards Mrs Kath Whitcombe presented them with a cheque for £900 this being the total amount raised at our charity events held during the year. The group would like to thank everyone who gave so generously and helped us raise this fabulous amount.